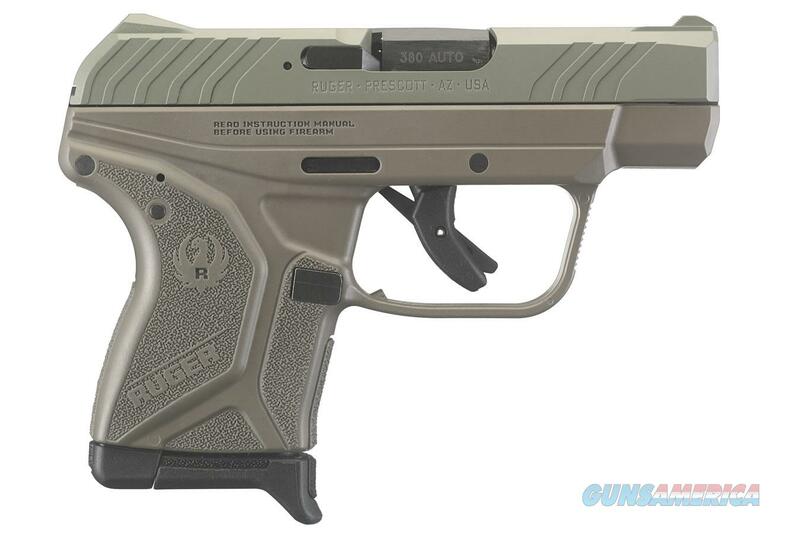 Ruger has expanded its LCP II line, and it now features a Elite Earth Cerakote Frame and Jungle Green Cerakote Slide. Best in Class Lightweight Micro-Compact. Sturm, Ruger & Company, Inc. is proud to introduce the new Ruger® LCP® II. Since its original introduction in 2008, the LCP has set the industry standard for compact, reliable .380 Auto pistols. Rather than rest on that accomplishment, Ruger has built upon that solid performance to produce the new, best-in-class LCP II pistol. - Compact at just 5.17" long and 3.71" tall, the LCP® II is designed to fit a variety of holsters and provide concealed carry options. - Rugged construction with through-hardened steel slide and black, one-piece, high-performance, glass-filled nylon grip frame. - Short, crisp trigger pull with single-action feel. - Textured grip frame provides a secure and comfortable grip. Larger grip frame surface provides better distribution of recoil forces. - Includes finger grip extension floorplate that can be added to the magazine for comfort and grip. - Easy-to-rack slide designed to hold open after last round ejection. - Blued, alloy steel barrel. - Improved sights for superior visibility. Fixed front and rear sights are integral to the slide, while the hammer is recessed within the slide. - Safety features include bladed trigger safety; neutrally balanced sear with significant engagement and strong spring tension; and hammer catch to help prevent the hammer from contacting the firing pin unless the trigger is pulled. - Also includes a pocket holster and one 6-round magazine. - Note: 6-round LCP® magazines are compatible with the LCP® II, but will not activate the last round hold-open feature of the LCP® II. 7-round LCP® magazines are NOT compatible with the LCP® II.